There must be some bond of union between mass and the chemical elements; and as the mass of a substance is ultimately expressed (although not absolutely, but only relatively) in the atom, a functional dependence should exist and be discoverable between the individual properties of the elements and their atomic weights. 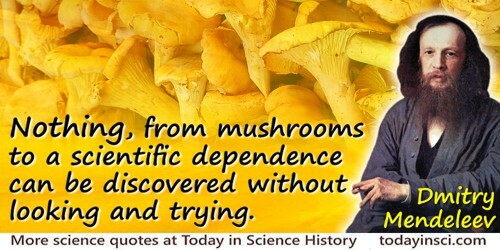 But nothing, from mushrooms to a scientific dependence can be discovered without looking and trying. So I began to look about and write down the elements with their atomic weights and typical properties, analogous elements and like atomic weights on separate cards, and soon this convinced me that the properties of the elements are in periodic dependence upon their atomic weights; and although I had my doubts about some obscure points, yet I have never doubted the universality of this law, because it could not possibly be the result of chance. Principles of Chemistry (1905), Vol. 2, 18.